1. Oh Johnny! Oh Johnny! Oh! Gladys Mills - one time superintendent of the typing department at the Paymaster General's Office in London - turned professional pianist in 1962 at the age of forty, and has since become a household favourite. Mrs. Mills has been playing the piano for most of her life. She began at the age of three but lessons ended for her when she was twelve years old. She was fourteen when she entered her first talent contest, and needless to say she won it. As a member of an amateur concert party Mrs. Mills travelled many hundreds of miles during the last war entertaining the troops, visiting camps, gun-sites and military hospitals throughout England. It was at a golf club social evening that club member Paul Cave heard band pianist Mrs. Mills and gave her a phone number to ring. This she did and found herself booked to appear on Billy Cotton's television show and to make her first record. 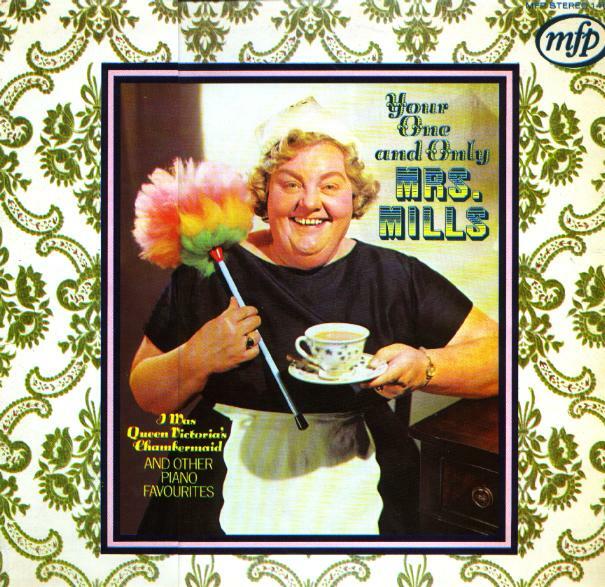 Since that time Mrs. Mills has made countless records and her popularity has risen over the years Hear her now on this record as she plays twelve bright and breezy tunes including Second-hand Rose, I'm Nobody's Baby, Candy Floss and Oh Johnny! Oh Johnny! Oh!, together with many more, a tremendous selection of popular melodies with that extra touch that only Mrs. Mills can add, so why not sit back and listen to the cheerful sound of Your One and Only Mrs. Mills.